This exercise helps to combat sagging muscles around the buttocks and thighs. 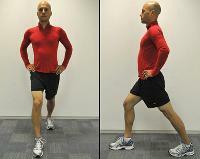 For extra work, draw the knees closer together or hold at the top of the lift for a number of full breaths in and out. Work up to three sets in total. 2. Breathing in, engage the muscles in the buttocks and back of the thighs and raise the pelvis away from the floor. Hold at the top for one breath in and out. Roll down with the out-breath in a controlled manner. Repeat 12 times. Sit on the front of a chair, feet hipwidth apart. Ease yourself forward and place your hands on the edge of the seat on either side of your buttocks. Support your bodyweight with straight arms (don�t lock your elbows), knees bent. Breathing out, bend your elbows to lower your torso until your shoulders are in line with them. Breathing in, push on your hands to return smoothly to the starting position. Work up to 12 repetitions. Keeping the core muscles that support the torso in good alignment helps you retain a youthful silhouette. In this lift don�t come up too high. As soon as the stomach bulges outward come down a little. Work up to three sets. 2. Breathing out, draw your abdominal muscles toward your lower back and lift your head, arms, shoulders and upper back. Hold, taking a breath in and out. Breathing in, lower your upper body back to the floor. Repeat 8�12 times. At the end of an exercise session, leave enough time to cool down to bring your heart rate, breathing, and temperature nearer normal (failure to do so can lead to dizziness, cramps, and soreness next day). As we age, muscles lose moisture, making them stiffer. Stretching stimulates lubrication of the tissue, and stretching out muscles while warm increases their length and flexibility, reducing risk of injury and keeping the spine, pelvis, and hips mobile. Bring body temperature back to normal by walking around the room for 5 minutes, gradually making your movements slower as your heart rate returns to normal. This helps return blood circulation to the organs and brain, guarding against fainting and dizziness. When you no longer feel sweaty or out of breath, move on to stretching. Stand facing a wall, one foot a good step behind the other. Press into the wall, front knee bent, and feel a stretch through the back heel. Place the ball and toes of the front foot on the wall and bend that knee to stretch the lower calf. Take the same foot to its buttock and hold, knees together. Turn your back to the wall, extend the same leg forward (toes raised), bend the standing leg and pivot forward to feel stretch at the back of the thigh. Repeat on the other leg. Interlinking fingers, turn your palms to face front and extend your arms forward, feeling the shoulder blades open. Raise your hands overhead and hold. Release and bend your left arm. Placing your right hand below your left elbow, guide the arm backward, taking the left palm toward the shoulder blade. Repeat on the other arm. Interlink your fingers beside your buttocks and raise the arms up and back; feel the chest opening. Kneel with feet together, buttocks on your heels, palms resting on your thighs. Sit tall for a few breath cycles. Open your knees wide. Exhaling, hinge forward from the hips, place your hands on the floor and ease forward, leading with the crown. Focus on your breathing for up to three minutes, releasing tension with every exhalation. Come up slowly, head last. Lie on your back with legs outstretched and arms extending behind your head. 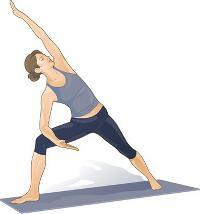 Stretch the front of the body by extending from toes to palms. Imagine touching both sides of the room. Now press through your heels and up to your fingernails, drawing your abdominal muscles toward the floor. Feel the stretch along the back of the body. Sense the difference between front and back. In a study reported in the Journal of Sports Sciences, people who visualized muscles elongating as they engaged in stretching exercises found flexibility came more easily. Another study found that people who imaged doing push-ups increased their push-up strength half as much as those who actually did the push-ups. As you stretch, picture the muscles you are working lengthening and becoming more dense and youthfully juicy.